Even with high-tech technology and skilled, qualified radiologists, early and reliable diagnosis of breast cancer remains challenging. According to the German Cancer Research Center in Heidelberg, some 69,000 women in Germany are diagnosed with breast cancer every year, with almost 18,000 dying of the disease. Conventional diagnosis methods, while well established, are not always reliable. 3D imaging with high isotropic resolution, on the other hand, offers clear advantages. 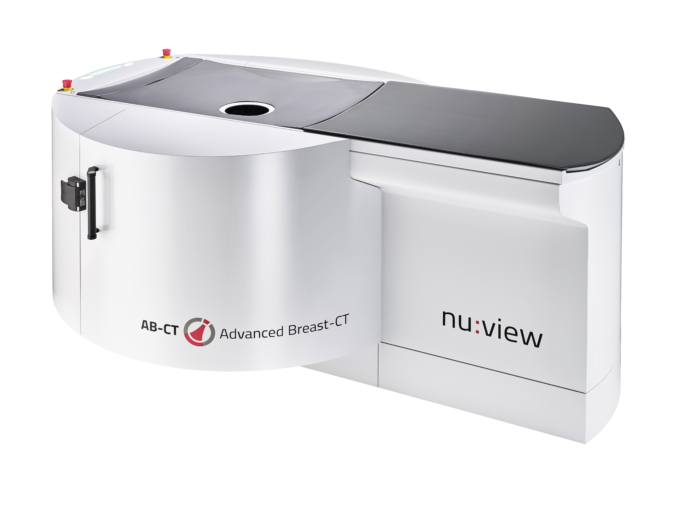 nu:view, the world’s first breast CT scanner to use spiral CT technology, is the brainchild of Erlangen-based company AB-CT. With the CE marking for nu:view in place, the new scanner is already in use on patients at the University Hospital Zurich (USZ). What sets nu:view apart is the very high image resolution coupled with low radiation dose and short scan times, explains AB-CT CEO Benjamin Kalender, referring to the benefits of the new CT scanner. “To obtain the best possible image quality and maximize radiation dose efficiency at the same time, the detector uses state-of-the-art single photon counting technology.” Unlike conventional scintillation, nu:view uses detectors made of cadmium telluride (CdTe), transforming every x-ray photon directly into an electric pulse. In a single rotation around the female breast, 2,000 projection images are created, with a full scan taking as little as seven to 12 seconds—at very low radiation levels without breast compression, ensuring excellent patient comfort. “For the first time we have a CT scanner that makes it possible to acquire an image of the entire female breast in a single scan in true 3D, imaging both the soft tissue and the calcifications,” the CEO explains.